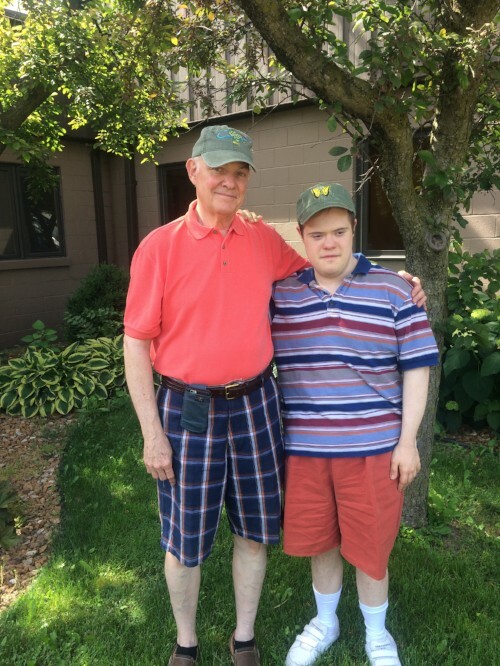 Steve is Dad to Allen, who is 26 years old and has Down syndrome. Allen receives services from DSC. Allen is the youngest of four children whom Steve and his wife Donna have. Allen misses his siblings, all of whom live out of the area. Each child with disabilities is unique and their family setting is unique, but as parents, we can understand the challenges and special moments that other parents experience. Until I retired a few years ago, Donna was primarily responsible for his care. Now we share that responsibility better. After heart surgery at an early age, Allen has been in good health. He is generally happy, loving and a real teaser. But, he will never be able to care for himself. Often, we take life a day at a time, but always with a concern about what will happen after we are no longer able to provide care. An ongoing challenge has been Allen’s inability to communicate. It is frustrating to him as well as to Donna and me. We have tried different things, but progress is slow, and sometimes we are the only ones who can understand what he is trying to say. But, I have noticed how “in tune” he seems to be to nonverbal language and his ability to sense other people’s feelings. I have come to appreciate his sensitivity to this and it has increased my awareness of nonverbal communication. Allen shares our love of music, from classical to modern. We enjoy many concerts together, but the best was the Beach Boys concert he and I attended a few years ago at the Virginia Theater. That was a terrific experience! Rock and Roll is his favorite!